You can’t ever go wrong with the classics. 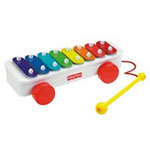 Today we look at one of the best classic toys, the Fisher-Price Classic Xylophone. This musical toy will bring back nostalgic memories for many of us while providing fresh entertainment for the children in our lives. This toy is designed for kids 12 months up to around 5 years old. The mallet is connected with a short string so that it won’t get lost. You may also be interested to see our list of The Best Toy Guitars For Toddlers. Well it’s a sad day for me. I’m a pretty big fan of LeapFrog toys, but I’ve come across my first LeapFrog toy that has left me disappointed. We recently bought the LeapFrog ClickStart for my 3 year old. I was so excited. The problem is that once we opened it up and started using it, I found the mouse to be difficult to control. The keyboard responded just fine, but the mouse just would not do what it was supposed to do. I tried using it with brand new batteries, on the mouse pad provided, and on other surfaces to see if anything would help — and nothing did. I’m sad to say that I’m returning the ClickStart. The ClickStart gets mostly positive reviews on Amazon, but after my problems with this toy, I did go back and notice some of the other comments had problems with the mouse also. So I don’t think that this mouse issue is unique to me, but certainly there are many people out there who love this toy, but for us, it’s in the “to be returned” pile. 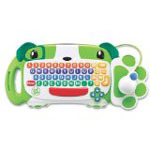 If you are looking for a LeapFrog learning toy for kids this age, I still really like the LeapFrog Tag Jr. We bought the Tag Jr. and several of the books last year and it has been a great toy for our 3 year old. One great thing about this toy is that the kids play with it at home and it’s also great toy to keep in the car when traveling. Here you can see my list of the Most Popular LeapFrog Tag Jr. Books. After watching Toy Story 3, I had to create a list of some of the Best Toy Story 3 Toys based on the new movie. The movie was great. It had a cute story, the animation and 3D effects were awesome, and it didn’t feel like a sequel — the movie really stood on it’s own as a good story. If your kids love Woody, Buzz and all the toys as much as my kids do, then you should check out some of these best sellers. The movie Toy Story 3 has brought us some new branded Lego sets that are sure to be popular with kids this year. These sets are available for younger kids in the Lego “Duplo” series with larger blocks and for older kids in the regular size Lego blocks. For younger kids age 2 year old up to about 5 year old, check out the Lego Duplo Series.